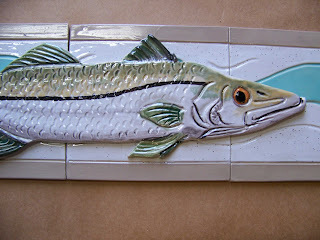 Diane's Art Stuff: Snook tile with green color. Snook tile with green color. I finished the color sample for the snook tiles. The client wanted the snook to have yellowish green fins. I have placed it on the wave tiles with turquoise wave. I think it lookd really good. What do you think? This is a fun project. I can't wait to see it installed. New Blue Marlin backsplash comming up soon. by for now. Diane H.
I just love these tiles! They are going to look so nice in my bathroom...Thanks Diane!